shahid\";p=\"61109 wrote: Indian O/U called Modern. Shahid, Any idea how much the O/U costs. snIPer\";p=\"61155 wrote: Shahid, Any idea how much the O/U costs. Between 20 - 25 K.
Modern has extractors and a ventilated rib too. Extractors I have mentioned,but wasnt aware about the ribs,as the earlier ones did not have them. Ah that is indeed interesting. I think these are not available in Bangalore - havent seen any here. Sanjay\";p=\"61166 wrote: Extractors I have mentioned,but wasnt aware about the ribs,as the earlier ones did not have them. You are right Sanjay, the newer Modern O/U s have a ventilated rib. Looks good !! snIPer\";p=\"61168 wrote: Ah that is indeed interesting. I think these are not available in Bangalore - havent seen any here. The one left at Bangalore Armoury is way too tight though. Phone up the other shops to enquire. KSRA member, Nahaar, bought one a couple of months back and it is an okayish O/U with triggers that make you think the safety may still be on. However, one soon gets used to it. 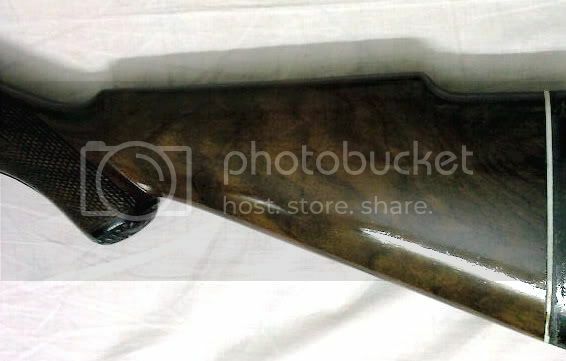 Don't expect to see the sort of fit or finish seen on imported shotguns. Splitting this thread into two. Mack The Knife Bana\";p=\"61204 wrote: Don't expect to see the sort of fit or finish seen on imported shotguns. I agree whole heartedly . But this kinda stock grain is not too bad, neither is the grain flow. PS. 35 K is too steep. Thanks Rusty I will check that out. I agree 35 is way to high for a Indian shotty out of Jammu,for around 35-40 one can pick up a good Belgian/English shotty,sometime back I saw a hammered SxS Beretta going for around 25,the condition was pretty good. RP could you post the complete pics of the gun. dont like pistol grip or prince of wales on a shotty...personal prejudice, but wot the 'ell! Price in Meerut - Delivered to Aligarh by courier is INR 27,000. Should have arrived now, will try it out this weekend if i am there in Delhi. Might to travelling to Patna for the 150 yrs anniversary of my school.